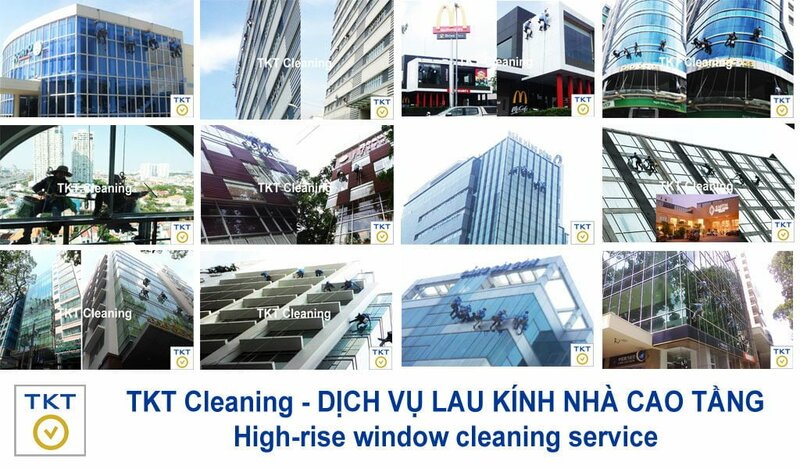 High rise window cleaning service including: glass, aluminum, aluminum frame, aluminum spokes… of tall buildings in Ho Chi Minh City, Binh Duong, Dong Nai: PROFESSIONAL – METICULOUS – SAFETY – PRICE MOST COMPETITIVE. 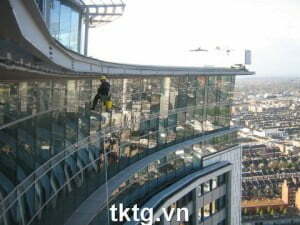 Clean the window, glass after construction, bringing elegance, modernity and wealth for buildings, offices and buildings. Clean the glass regularly to help prolong the life of the glass, especially the expensive tempered glass panels. Because acid, dust ion, long days will stick to glass blur, opaque, even glass corrosion. 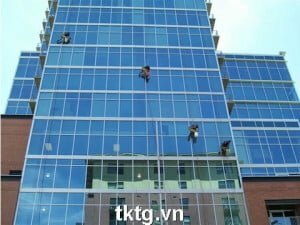 TKT, Cleaning service company specializes in industrial cleaning of facades, facades for skyscrapers, buildings, offices … We do not just clean the glass high-rise buildings, we also offer our customers a total solution for cleaning facade, face up. With staffs, cleaners training focuses on discipline, safety and meticulous when working on high. All employees are insured safety, work at height certifications, have enough experience to execute the construction of tall buildings hygiene difficult. Install and inspect and safety of sanitary equipment. Move furniture or canvas covered water. Use a tool to remove paint, glue, silicone … stick on the frame and on the glass. Use special chemicals for cleaning hard stains. Mix chemicals at the rate appropriate. Wet glass with a sanitizing solution. Dip into buckets chemical solution and then rub along the horizontal Thickener top-down for the rest of the glass. Putting glass: Glass-gotten used under 1 in 4 ways: push along, horizontally brushed, brushed or brushed under the right angle shape Thickener along the horizontal from the top down. While brushed, inclined blades hold 450 compared to the glass, not lifting up that blade to blade always pressed to the glass. Wipe blades dry with a towel after every cast. After brushed finish, use a dry cloth to wipe around the edges of the glass. Clean the glass from a glass on down to the bottom. When the work is completed, remove the canvas cover, insulated wire tension. Move furniture into position, remove the equipment, then wipe clean. Return to original state area clean.